"Les archers de la Nymphe"
Dimensions: 11 - 15 m of open sea x 24 m of long. Materials: Small boat coming from the installation of Paul-Armand Gette «of the immobility of trip» in the Abbey church of Saint-Philbert-de-Grand-Lieu, linen, stakes, rope, clothes pegs, mowing of the site. Photograph: A picture prepared for the edition of the newsletter n°1 by "Les archers de la Nymphe". A small panel for Noémie de la Cotte: 60x80 cm. When Arnaud de la Cotte solicited me, I was first rather crafty, everything in my affair - the installation led to the Hovel for some years facing the lake is still not ended. Lack of available funds certainly But insistence of helping Arnaud, plan made its way And these slidings expensive to Paul-Armand Gette occurred: the garden became the theatre of speculations where we already imagined some prodigies. Rethinking at previous stages of my plan I offered to Arnaud to bring back the small boat whom had used In P.-A. G. for «of the immobility of trip» in the Abbey church of Saint Philbert. This loan signed my membership in the plan of "les archers de la Nymphe (the «bowmen of the nymph).. The small boat should be installed with the aim of the home, the lake in bottom of stage. The craft so came to reactivate my previous job, rewarding of a first sliding. History is simple; the parallel with stay of In P.-A. G. to Saint Philibert also, Arnaud had recalled me again and again the episode of the tincture of the sheet intended to dress the nymph. Sheets, manipulated, in cork, folded well or in the wind, decline the job of the laundry worker. The landscape is rural. The lake already leaves the place in the grasses which announce a state change. 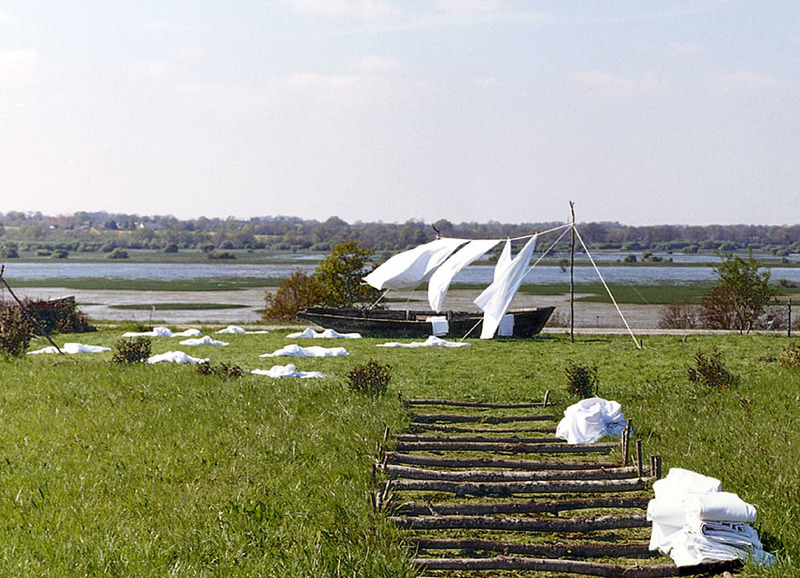 These arranged sheets here and there seem to narrate us an unlikely trip, left on the way before skimming grasses or banging in the wind above the small boat... Would the air of anything the laundry worker be a nymph?